The experienced team at Chandler Stoneworks have extensive experience working with kitchen worktops available in a range of different materials. 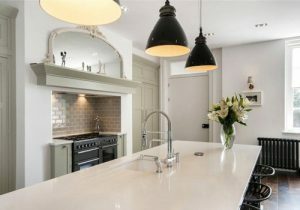 Whether you are looking for high quality marble worktops, stunning limestone worktops, or worktops made from slate, granite or quartz composite, we will provide expert advice and assistance on the best style of material for your kitchen design and your home. With a personalised service designed to suit your needs and an average turnaround of 7-10 days, we take pride in providing a first class service that perfectly meets and exceeds client expectations throughout Portsmouth and further afield where required. We offer a fast and reliable service in addition to our expert project management service. 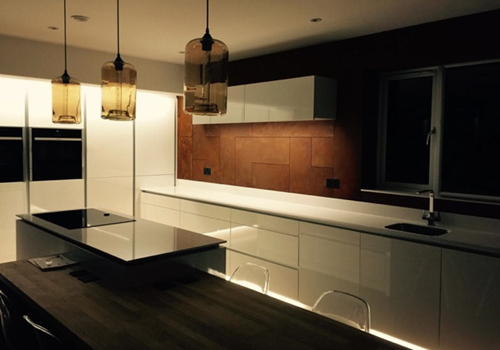 We will work with you throughout the entire project, offering a full templating and fitting service that will allow you to make the best use of the space available. We also provide a number of cleaning care-kits and maintenance products in order to make sure that you get the very most out of your beautiful natural stone kitchen worktops. Quartz kitchen worktops are made from a highly sought after material and have been specifically developed for kitchen purposes. Resistant to staining, scratching and heat and with an intense durability, this exquisite material is available in a wide range of colours and also has an ‘eco’ range option developed by Cosetino, which is made from fully recycled materials. Our granite worktops add a contemporary feel to any kitchen design and can be used in a range of different styles. The granite kitchen worktops are highly resistant to heat and are also durable and hard-wearing, making them perfect for any kitchen environment. 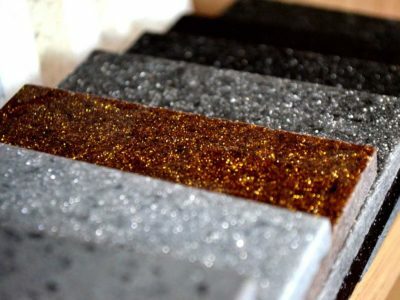 We offer granite worktops in a range of different speckled designs. 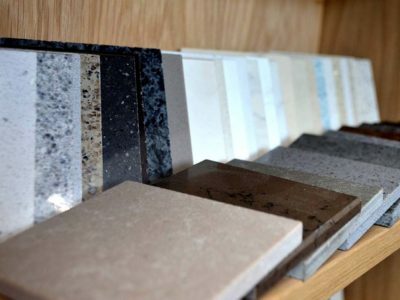 Chandler Stoneworks take pride in being leading suppliers and installers of a number of countertops, worktops, bathroom vanity tops and more, which is why we make sure to stock high quality natural stone materials from only the best brand names. We work in conjunction with a number of leading brand manufacturers within the sector, a few of which can be seen below. 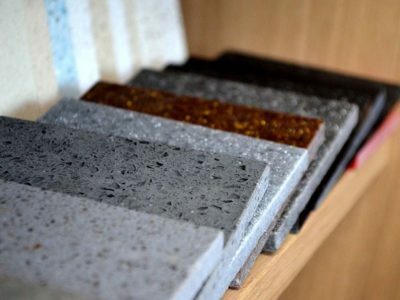 Arena Stone – Natural granite and marble countertops and kitchen worktops in a variety of different colours to suit all kitchen styles. Arena Stone offers beauty and durability rolled into one natural stone surface. Caesarstone – Specialising in quartz surfaces, Caesarstone supply stunning quartz tiles in over 30 different colours to clients throughout the UK. Their exquisite worktops are suitable for a range of applications, including both kitchen and bathroom use. Samsung – High quality raw materials are used to create beautiful radianz quartz that are useful in a number of applications. Samsung specifically manufacture these tiles to require little to no maintenance and to ensure that they are four times more durable than alternative materials. 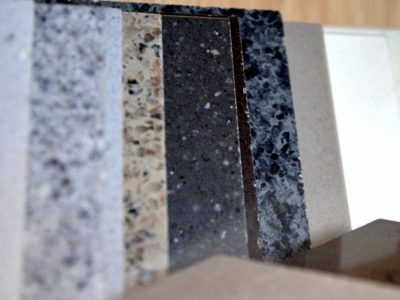 Chandler Stoneworks draw from over 10 years’ experience in the supply and installation of kitchen worktops and countertops in Portsmouth and throughout Sussex, Surrey and Hampshire. As a family-run business, we understand the importance of high quality, durable and long lasting kitchen worktops and stone tiles. Working to meet the needs of each client, we offer a completely personalised service designed to ensure complete satisfaction throughout the entire project. We also offer tailor made flooring solutions and can provide made-to-measure chopping boards and other accessories to add those perfect finishing touches to your kitchen. Chandler Stoneworks take pride in providing first class services that focus on the individual requests of the client, every time. We are always proud to receive testimonials and feedback from happy clients. Taking special effort to ensure our clients are satisfied with their end product, we have listed some examples of the glowing testimonials we have received. More reviews can be seen on our testimonials page. 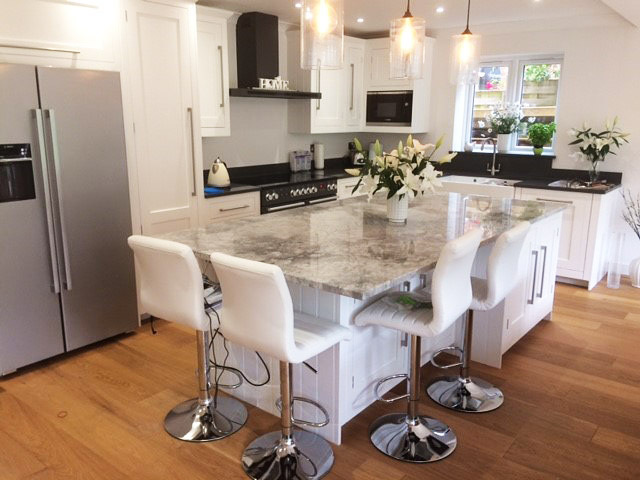 To find out more about the expert advice and assistance we provide on choosing the perfect kitchen worktop for your Portsmouth home, or to find out more about the other services we provide to clients across Sussex, Surrey and Hampshire, please get in touch with us today. Simply call us on 01903 885941 to speak to a member of our team who will happily help you. Alternatively you can also email us at sales@chandlerstoneworks.co.uk where we will get back to you as soon as possible. If you would like to visit us at our showroom we are open Monday to Friday from 9:30am – 4:30pm and on Saturdays by appointment only. Our showroom is beautifully designed so that you can view all of our stone tiles available for kitchen and bathroom design. You can arrange a meeting with one of our stone masons or customer service to discuss your individual requirements by phoning ahead beforehand to ensure that a member of staff is there to greet you when you arrive. We look forward to hearing from you soon!